These flowering gardens are known as Chinampa (see https://en.wikipedia.org/wiki/Chinampa for more than you’ll ever need to now on the subject) and the famous tourist attraction is found at Lake Xochimilco. Being there on a week day was absolutely ideal, with hundreds or even thousands of brightly painted sightseeing boats lying empty. But during weekends and public Holidays, the canals must be heaving with them. In between the tourist bands, there are others selling food, drinks, souvenirs or even with musicians – complete Mariachi bands – entertaining the tourists. We managed to capture it all on digital images and video. Apart from some display gardens that could be visited, with some plants for sale, there was also a small exhibit of reptiles. Alain complained of being hungry. 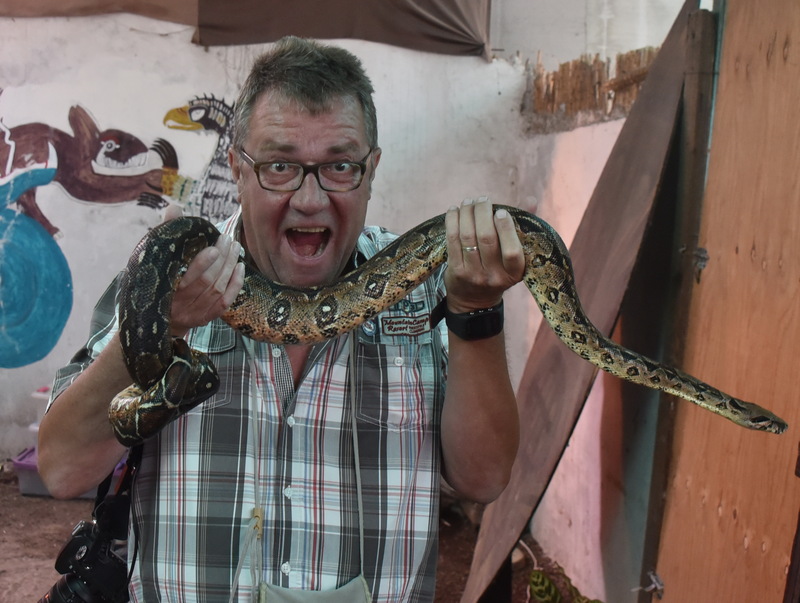 BTW the snake (below) is a real Boa constrictor! The weather forecast had warned of thunderstorms around 17:00 hrs, and sure enough, 30 minutes earlier and safely at the Hotel, copying our image files, the rain burst out. By 17:00 hrs, it was all over so that we can venture out for a Margarita! HOORAY, it’s official : Final score: Cactus Explorers 3 – corrupt Mexican Police 1!!! For Cactus Explorers read Alain Buffel who again performed magic by weaving our car safely through the mad Mexico City traffic, safely back to the Europ Car depot. Yes, you’re right; we’re a day early! 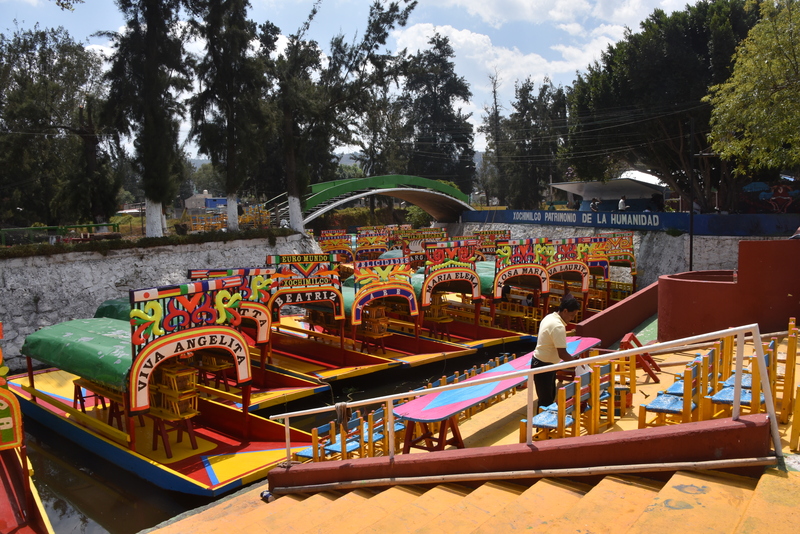 While we hugely enjoyed the hotel and some rest in Tehuacán, Alain suggested that if we went back a day early, we could spend the day (tomorrow) at the floating gardens of Mexico City, built by the Aztecs hundreds of years ago. Monty Don did a BBC TV documentary on the subject. Tomorrow it is our turn. Today we dropped the car off at 13:00 and by 13:30 were at a cheap(er) hotel at the airport, stuck between the expensive hotels where we can use the ATM machine and the pedestrian footbridge to Terminal 1 from where we leave on Wednesday. The first part of the walk to the airport is along a narrow, uneven pavement – no joke with 7 weeks of luggage + souvenirs, so we may pay a few pesos for a taxi. 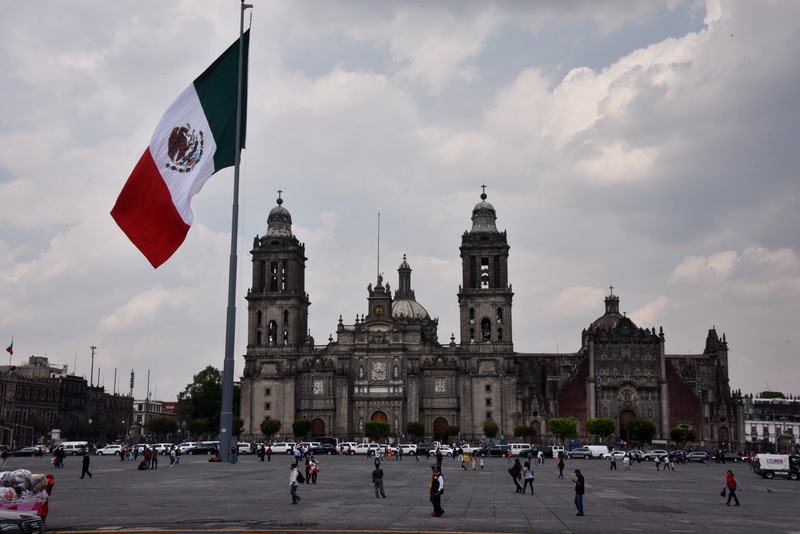 Faced with an afternoon of doing nothing, we asked the reception desk if they could recommend a good reliable taxi – they could, so that by 15:00 we found ourselves on the Zócalo, the common name for the Plaza de la Constitución, the main square in Mexico City. Mexico City Cathedral, with the Metropolitan Tabernacle to the right. I spotted the Mexican equivalent of the London City bus, an open double decker from where you can see the town at your leisure and hop on and off, if time permits. It didn’t. We made it back to the pre-arranged taxi pick up point exactly one minute before our man arrived, exactly on time. So he has been hired as our driver for tomorrow’s trip – if it doesn’t rain! We had a few spats while sitting on the open top deck of the tour bus. The commentary on the bus claimed that the Zócalo is one of the largest squares in the world, but a search on the internet reveals that it was ‘only’ the 70th largest. You need to take my word for it that Sunday was a ‘No News’ day, in fact a repeat of our last day in Tehuacán with Chris and Jonathan, getting the car washed – they remembered us! We went to the shopping mall to find a barber, for Alain to have his traditional haircut while on holiday – he succeeded eventually just around the corner of the hotel! Lots of margaritas were enjoyed (last night) and waiters cried as we said our goodbyes. 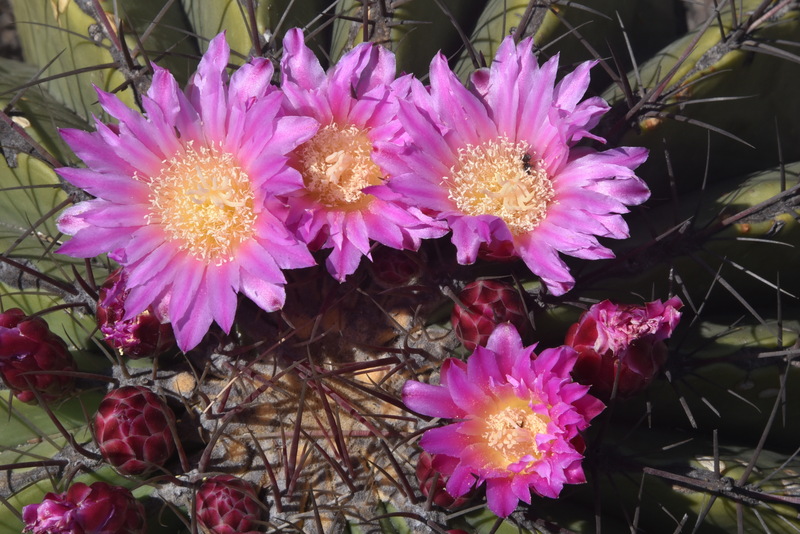 No images taken today, so a good excuse to fill the space to the right with another image of Ferocactus haemathacanthus in flower yesterday at S3649. In addition lots more plants in advanced buds. Before coming on this trip, I had never heard of these two towns, nor of the Mexican State of Tlaxcala, of which Apizaco is the second largest city. Now I have spent a very pleasant night at each and have taken pictures to remember impressions. I also have a day’s worth (48) of 3 minute long movie clips, as we drove through the often dramatic scenery, including the pickup truck with cover for the back that seemed to explode as it came past us. It’s quite time consuming to go through 48 x three minute film clips to see what, if anything, I caught on film. 95+ % will probably never be viewed again, but it is good to have options! 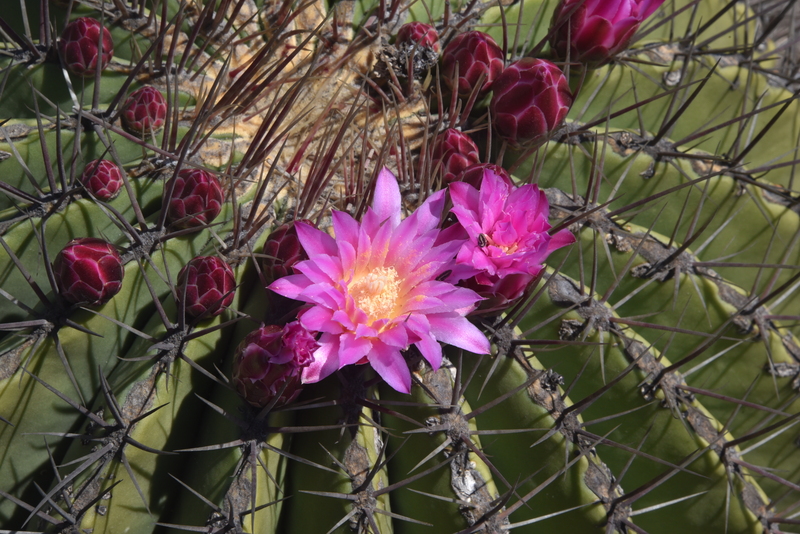 Only two picture stops, non of which featured any cacti or other succulents (again – is this really a cactus trip? Why?) The first was just for pictures along the side of the road, such as stands where women were selling fruits etc, and a sign that struck me as funny such as ‘No Pisar, El Pastor’. In time, translation software will tell me what it means in English. The second stop was for sightseeing in Apizaco. We stayed at the City Express Hotel, brand new and part of a complex that is a restored version of the old railway station. Soon after we had signed in and began to explore the facilities, such as the internet, we were reminded of what it means to be in a railway station – the haunting sound of train whistles! Fortunately, it was the one and only time that we heard them. My fitness instructor dragged me for a walk around the town which yielded more pictures and did actually make me feel better after a day in the car. Unfortunately, the feeling of well being did not extend to my fitness instructor, but all is well a day later after his last Ferocactus stop. Just withdrawal symptoms then. Heavy rain was reported by Alain before I woke up. It still looked grey and threatening at 7 but only gently dripped as we packed the car at 9. For the first time for days we had a target plant stop – for Melocactus delessertianus, said to be another synonym of M. curvispinus. We had seen M. curvispinus, posing as M. oaxacensis on the Pacific Coast, and as a result were aware that plant would be difficult to find here in the much more lush vegetation. The plant was reported by Alfred Lau as Lau 1104 ‘from Jalapa to the sea at Palma Sola at 0-800 m altitude – quite a range. 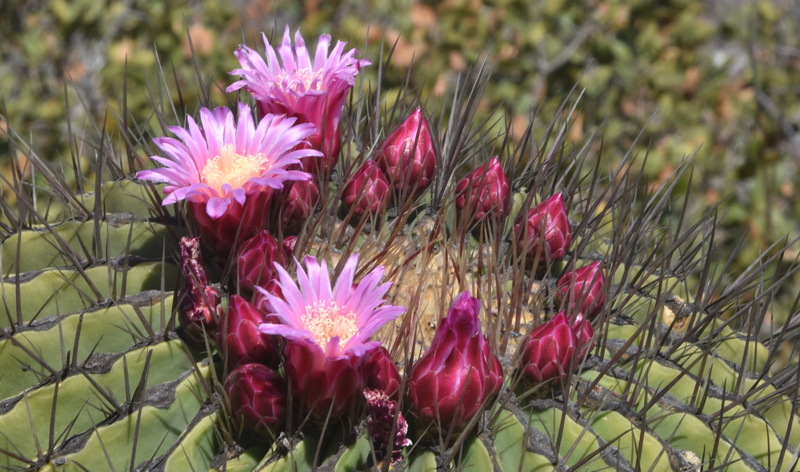 It was said to grow with Mammillaria eriacantha, M. heyderi, Pilosocereus sartorianus and Selenicereus coniflorus. The problems were: there was no town called Jalapa, we assume the current spelling is Xalapa, farther in land. But we had driven from Veracruz – along the coast road, at 10 m above sea level. I had relied on being able to spot the Pilosocereus from the car, but the flora was still too lush. We had a time budget, as we also wanted to see the largest of four archaeological sites before finding our hotel and the Mex 180 Libre proved slower than expected, so we gave up. The overnight rain had brought even more trees out in flower and as we drove around the village of Palma Sola I managed to get some close ups of the flowers and also of the fruits, that clearly showed the trees as members of the legume, pea, or bean family, but the flowers do not immediately support this. A bit more searching back in the UK. For much of the trip we just drift from day to day – only the names of the days on my pill boxes and the headings of my Blog entries keep me in touch of the reality that this time next week we’ll be landing at London Heathrow T5 and a more regular life starts again. It was 14:00 hrs when we arrived at the Temples of Tajin. This was by far the largest and most impressive sites visited and we spent some two hours around the site, taking many images of the remnants of what must have been a large and flourishing town. We did manage to see and photograph some cacti: Rhipsalis baccifera and a Hylocereus sp.(?). Again, there was no problem taking pictures and no high visibility security presence. Compared to the crowds visiting Stonehenge everyday, it was very quiet. As a result we were able to take lots of great pictures. Again, my fitness instructor marched me around for nearly two hours – well worth it in terms of pictures! The town of Poza Rica is only some 20 km from El Tajin, with plenty of hotels to chose from. The Best Western was close to the entrance to town, so will give us a quick get away tomorrow.